Oregon's Construction Lien Law is codified at ORS 87.001 to 87.060 and 87.075 to 87.093. Contractors, subcontractors, and material suppliers can often have problems getting paid by property owners or other parties involved in the chain of dealings. Luckily, there is a remedy for these persons known as a construction lien. A construction lien works like a mortgage by creating a security interest in the title to real property as a form of collateral. A contractor or other party holds this interest and in turn can foreclose on it to force payment. In Oregon, any person performing labor upon, transporting or furnishing any material to be used in, or renting equipment used in the construction of any improvement is entitled to a lien upon the improvement for the labor, transportation or material furnished or equipment rented at the instance of the owner of the improvement or the construction agent of the owner. O.R.S. 87.010(1). To claim a lien, the party providing labor or furnishing materials must first send a preliminary notice to the owner, in the form of a Notice of Right to a Lien, within 8 days of such furnishing. O.R.S. 87.021(1). The purpose of this notice is to make the owner aware that someone will be performing work that entitles the contractor to claim a lien, which in turn protects the owner from a "hidden lien." If the notice is not sent on time, a claimant can still send one out later and claim a lien but, the lien only covers the 8-day period before the pre-lien notice is sent. Once the pre-lien notice has been sent and work has begun, and the proper party never receives timely payment, a mechanic's lien can be claimed not later than 75 days after the person has ceased to provide labor, rent equipment, or furnish materials or 75 days after completion of construction, whichever is earlier. O.R.S. 87.035(1). The lien must be perfected by filing a claim of lien with the recording officer of the county or counties in which the improvement, or some part thereof, is situated. O.R.S. 87.035(2). A person filing a claim of lien must mail the owner and the mortgagee a notice in writing that the claim has been filed. O.R.S. 87.039(1). 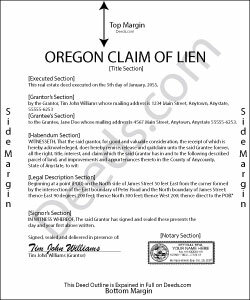 A copy of the claim of lien must be attached to the notice. Id. The notice must be mailed no later than 20 days after the date of filing. Id. By keeping track of dates, staying organized, and keeping a vigilant eye on each account, protects the claimant's right to a construction lien. This article is provided for informational purposes only and should not be relied upon a substitute for the advice of an attorney. Please contact an Oregon attorney with any questions about construction liens. Reply from Staff: Thank you Daniel. Judy F. said: I thought your site was focused on my specific county, but it wasn't. Therefore, I did not complete a transaction. Reply from Staff: Thank you for your feedback Judy. Our site is national, we focus on all jurisdictions. Have a great day. Amanda S. said: Thank you! My husband and I went in the get notary stamps for a Special Warranty Deed and a Post Nuptial Agreement. The representative was very knowledgeable and thorough with the notary process. She made sure we read and understood all documents that we were signing and they required us to recite in sworn statements that everything there was true and understood! I will be using the notary service again at Bank of America! The representative was very respectful and had a nice smile the entire time to make our visit great! Cindi S. said: I asked for a letter of testamentary form and this is what I got. Not at all what I was hoping for. Just spent $20 for nothing. Very disappointed. Reply from Staff: Thank your or your feedback. We are sorry to hear of the disappointment caused when you ordered our Colorado Personal Representative Deed of Distribution hoping you would receive something entirely different. We have corrected your mistake by canceling your order and payment. Have a wonderful day. Reply from Staff: Thanks so much for your feedback Brenda, we really appreciate it. Have a great day!